Is it possible to change edit Bre.Ma Eko 902's clamping system? When I try to run a +1900mm groove, the machine will clamp in the center, is it possible to clamp from end to end? 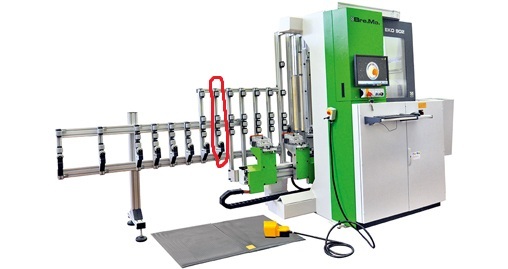 Because everytime it clamps in the center, the grooving would get misaligned: The rollers are suppose to keep it straight but when it reaches the end of the fixed rollers(see attached photo), the right side of the panel will decline because of the uneven clamping system. What is the size of the parts you are grooving? Are you using the saw or a router? Are you cutting the full 1900 groove in one pass or are the clamps re-positioning mid cut? You can manualy program the clamps to grip wherever you would like. We do this on several items to either make cutouts or run long routs without the clamps re-positioning.